Boxing has a “tough guy” image problem. The sport’s physical nature calls to mind images of black eyes and dark bruises. 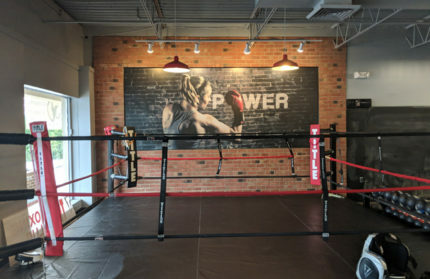 But recently, a growing number of local gyms are dedicating themselves to demystifying boxing. Even if you’re not interested in becoming a proficient pugilist, many trainers believe that incorporating boxing into your workout routine is a great way to start feeling—and looking—better. Finding a gym, trainer and routine that work for you might sound like a daunting task. However, Chester County is home to dozens of gyms, many specializing in boxing training for beginners. There’s never been a better time to lace up a pair of boxing gloves. Even at a beginner’s level, boxing is an exceptional form of both cardiovascular exercise and resistance training. But when you’re just starting out, learning proper boxing form and technique are more important than burning calories. Your first training session should focus on the basics—how to wrap your hands, put on gloves and hit the heavy bag without injuring yourself. Once you’re comfortable, trainers will work with you based on your current skill level. Don’t worry if you’ve never thrown a punch before. Most gyms employ expert-level trainers who are happy to work with people new to the sport. Typical training sessions will vary between gyms and participant skill level. The most common form of boxing exercise involves rhythmically hitting the heavy bag. This routine builds upper-body strength and boosts cardio functions. It’s a great workout with the added benefit of blowing off stress. Trust me, there’s nothing more satisfying than hitting a heavy bag after a tough day. Sanchez notes that routines like TITLE’s Power Hour combine cardio exercise and high-intensity interval training, two of boxing’s best fitness traits. Everyone knows that boxing matches are brutal. Philly’s fictional hero Rocky Balboa got pummeled countless times across six movies. But don’t let that discourage you. Most boxing gyms don’t throw students directly into the ring. In fact, non-combat training is one of the sport’s biggest draws. Sparring might attract some people to the sport, but for those just looking for a solid workout, you’ll never have to worry about getting hit. Most fitness-focused gyms have more than enough heavy bags to go around. These large bags are a cornerstone of boxing training. They’re designed to be punched—repeatedly—to help build muscle strength and stamina. In addition to heavy bag training, gyms offer specialized workouts. “We do personal training, too, which is a lot more technical,” says Sanchez. Personal training sessions afford participants a chance to hone their skills by punching target mitts. According to Sanchez, working out with the target mitts allows people to emulate what serious boxers do on a daily basis, like performing specific punches and jabs. Although boxing gloves are iconic pieces of equipment, what you wear under the leather mitts is just as important. Hand wraps are essential to boxing training. They’re pieces of cloth designed to reduce damage to the wrist joint and help reduce the raw impact of a punch. Hand wraps are available at gyms, as well as sporting goods stores, and are required to participate in training and boxing classes. Similarly, gyms should have boxing gloves available on site. Some, like TITLE Boxing Club, will loan a pair to first-timers, and most provide rental services if you don’t want to commit to buying a pair. Of course, if you fall in love with the sport, buying gloves is a worthwhile investment. Finally, it’s important to bring a pair of durable, supportive (and comfortable) tennis shoes. Boxing attracts people of all ages. Although it’s often viewed as a male-dominated sport, plenty of women are stepping into the proverbial ring. In fact, when Claressa Shields won the Olympic gold medal for Women’s Boxing in 2012, many women took notice. Learning the basics of boxing is physically and mentally rewarding. Training sessions and classes are designed to work your core and upper body. Even the most basic boxing workouts help tone muscle, and a one-hour class can burn around 1,000 calories. With practice and dedication, boxing might just be the best alternative to the weight room you’ve never considered before.